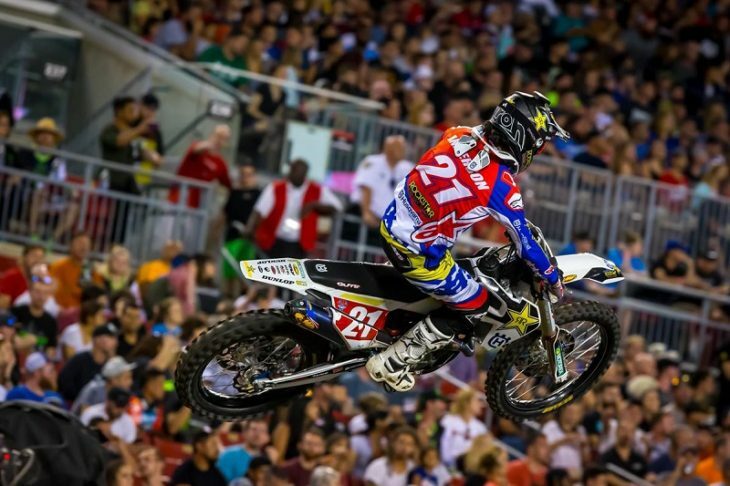 It was a solid night for the Rockstar Energy Husqvarna Factory Racing Team who made their first visit to Tampa, Florida’s Raymond Jones Stadium for the eighth round of AMA Supercross. Saturday’s racetrack proved to be a challenge but team riders Jason Anderson and Zach Osborne rose to the challenge to each land on the podium with third-place finishes in their respective classes, while Dean Wilson earned his best finish of the season with seventh in the 450SX class. Following a big victory to kick off the 250SX East series last weekend, Osborne got off to a great start in his heat race as he filed into second place on the opening lap. He wasted no time moving into the lead as he powered through the tricky sand section and into the first-place position. He maintained a steady pace to take his first heat race win of the season and a favorable transfer into the 250SX East Main Event. Osborne got off to a second-place start in the 250SX East Main Event as he piloted his way through a chaotic opening lap. He got passed early on to drop him back to third but he patiently waited to make his strike. It didn’t take long for him to capitalize on another rider’s mistake, allowing him to catapult back into the second-place spot. With just under five minutes left to go, He engaged in battle with French rider Dylan Ferrandis and the points leader ultimately dropped back to third. Despite a valiant effort in the final laps, he wasn’t able to reclaim the upper-hand and finished third for the night. Jason Anderson started his day in a positive way as he shot off the line to capture the holeshot and early lead in his 450 heat race. Unfortunately, the heat race was red flagged due to a downed rider and the group was then forced to restart in a single file line. Anderson led the pack on the restart, where he engaged in battle with Eli Tomac for the remainder of the race. He held strong to capture his fifth heat race victory of the season. In the 450SX Main Event, Anderson was sixth off the start and was forced to climb his way through the pack. By lap five, he began his bid toward the front as he made his first pass on Weston Peick for fifth. Anderson climbed one step closer to the podium when the race leader went down, giving him the fourth-place position. Then, he commanded the next spot from Cooper Webb as he powered through the corner to assume third-place with 11 minutes to go in the Main Event. He made a charge to catch the lead duo of Tomac and Musquin but wasn’t able to make it happen, ultimately finishing a hard-fought third to maintain his lead in the 450 championship. Dean Wilson was fourth at the start of his 450 heat race and moved into the third-place position before a crash in the whoops sent him back to the eleventh place position. Despite going over the bars, Wilson remounted and fought back to ninth, giving him the final transfer position into the 450 Main Event. Wilson was just inside the top-10 at the start of the Main Event after making several passes on the opening lap. He hovered in the tenth-place position for the first five laps before turning up the pace in the middle of the race. Wilson got up to eighth and set his sights on the seventh-place rider ahead. With three laps to go, he moved into seventh and earned his best finish of the season.